SYDNEY : An appeal to all supporters to plan now for the Hiroshima Day march and rally on August 9 has been issued by the Hiroshima Commemoration Committee, the city march will leave Hyde Park (Liverpool Street end) at 2 pm for a rally at the Trocadero, George Street, at 3 pm. A prominent national speaker on Australia’s relations with Asia will be the highlight of the first half of the rally; the second half will be a program of folksongs of peace and protest from some of Sydney’s leading artists. The Hiroshima Commemoration Committee suggests that families should hold picnic lunches in the Park before the city march, and should listen to, or join in with, groups of folksingers. On Saturday August 8, the Committee invites local supporting organisations to plan distribution of the pamphlet The Choice, published by a group of women peace supporters. The Committee invites supporters to arrange, where practicable, a pool of motor transport to bring others to Hyde Park for the picnic and march Banners and smocks can be prepared from calico available at the Committee’s office. Youth and music are expected to keynote this year’s activities for No More Hiroshimas in Melbourne. There will be a two-day march from Frankston to Melbourne. In Adelaide, interest in and support for the petition opposing French atomic testing is growing. Signatures have been collected in factories such as Islington Railway Workshops, British Tube Mills and Jury and Spiers, in suburbs and in city streets. Members of the Eureka Youth League and the Union of Australian Women are prominent in the work and have collected at least 300 signatures. Speaking in Denmark recently Soviet Premier Khrushchov made statements, of interest to supporters of a nuclear free southern hemisphere and to opponents of the US naval communications station in Western Australia. “We are great advocates of making a start somehow, with some territory, to clear the earth of thermonuclear weapons. 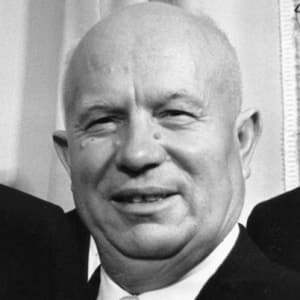 Asked if the USSR would he ready to include its northern territories in the proposed non-nuclear zone, he said the whole USSR would be included if the other powers would do the same with their territories. We will hit bases In a contrasting passage of his reply Mr. Krushchov said everyone knew US polaris submarines were based on Britain, spearheaded at the USSR. He was not threatening Britain, “but since Britain has accepted American rockets directed against us we have, of course, already allocated the necessary number of our nuclear rockets to strike at Polaris submarine bases at once, if war begins, and put them out of action. You can imagine, I think, what this means. “Countries which renounce nuclear weapons,, refuse to make their territory available for bases with such weapons and proclaim themselves as nuclear-free must be recognised by other powers as not participating in nuclear war if war breaks out. Next postAustria marches against Nuclear Weapons and signs the treaty!